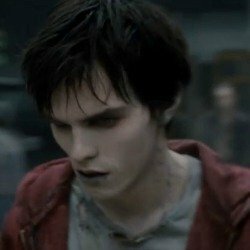 "He's Still Dead, But He Is Getting Warmer"
Warm Bodies, that’s what zombies eat, including "R" but unlike most zombies R seems to have his stuff pretty well together. Nice home inside an abandon airplane, a good record collection, even a friend who he has almost conversations with! But that is all about to change, because while on his way out to find someone to eat, "R" meets Julie, a scavenger from the last city of mankind. She is beautiful, funny, smart, and everything that R has ever wanted in a woman, this is so very much what R desires that it even makes his dead heartbeat. Only a single beat though, the bad thing is. She is alive. So what is a zombie to do? Warm Bodies is a delightful little zombie romance comedy, which follows the un-life of "R" and his every day undead life at the airport. That is until he meets the beautiful Julie; and if you miss the pun there, well, you’re not alone. After saving her from a zombie attack, R and Julie start to get to know each other, as much as they can that is. When Julie and R's relationship sparks a chain reaction that starts to rock the undead world to its core, it’s a race against time before the "Bonies" destroy them all. Nicholas Hoult (Xmen First Class) takes the role of "R" Teresa Palmer (Bedtime Stories) casting as Julie is a perfect match. The on screen chemistry of the two and ability to work off of each other is something normally seen in 'real' romance movies and not good ol' Rom-Zom-Com's, with Nicholas able to pull off the awkward teen-as-a-undead-zombie and Julie as an understandably crept out human. As a fun little fact Dave Franco (From Fright Night 2011) makes a short appearance as once again: A guy that doesn’t make it through the movie. It’s also great to see Rob Corddry getting work, because while not a person I would want to see on camera 24/7 he defiantly fills the roll he was intended to here, as the 'friend' of R. Finally good old John Malkovich makes his presence known as Julies father and zombie hater Grigio. Special effects team did a great job here as well, most of the zombies are tame enough for children with the only 'scary' looking ones being 'bonies' that look very much like anorexic burnt skeletons. CGI takes a front seat for most of the effects from bonies to some of the landscape but it all blends seamlessly in the film. My only real dislike of Warm Bodies; and it is minor, is that it happened 'too fast' for my liking. I expected something along the lines of typical zombie movie, something happens to this one, and he starts to turn more 'normal'; when in fact he starts the movie with inner thoughts and monologues, and simply lacks the ability to communicate well, and moves a bit stiffly. Minor though, and easily over looked with the big picture. So if you have not seen it yet, go and grab your ghoul-friend and or let your boyfriend raise from the dead space of his study, and go on out together. Have dinner at Applebee’s, and head to the movies to catch Warm Bodies. It will be a great night together and fun had by all.